Started with two small projects today. 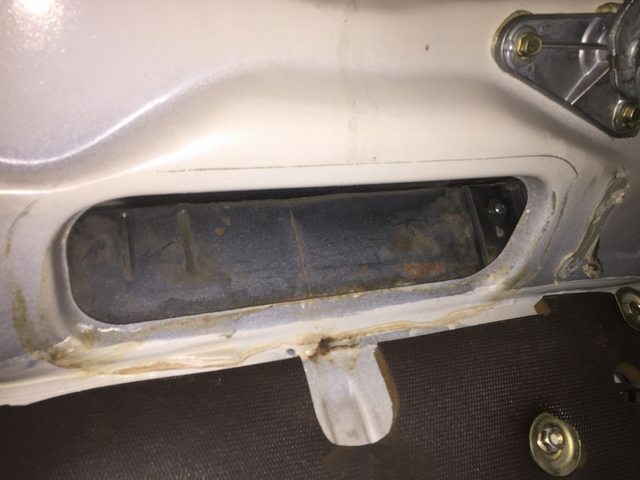 There were several embarrassing vacuum/boost leaks from caps disintegrating and blowing off the unused ports in the intake manifold. 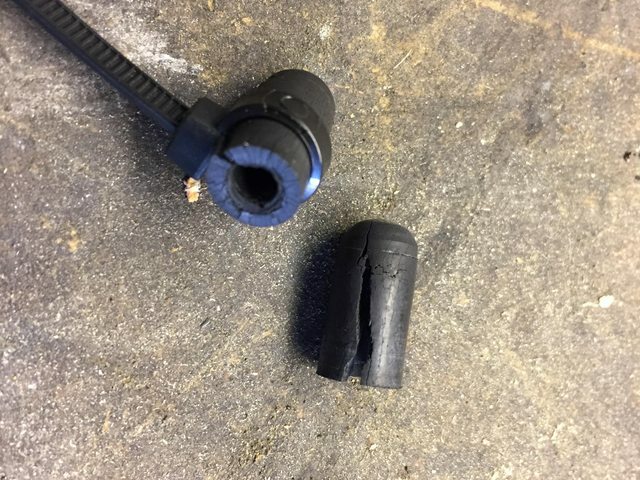 I was running some cheap rubber vacuum caps, which worked well at first but didn't survive the rigors of Redblock duty. Zipties didn't help much. I had some little heat shrink caps left over from another project. Two of the small smooth ones worked fine on the smaller ports. 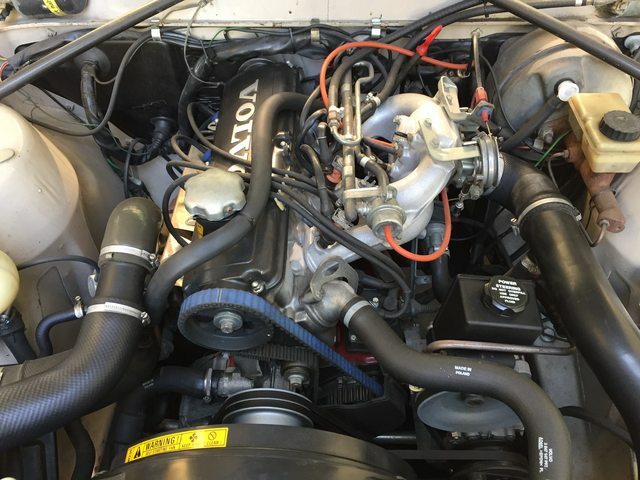 This bigger guy was needed for one of the open throttle body ports. 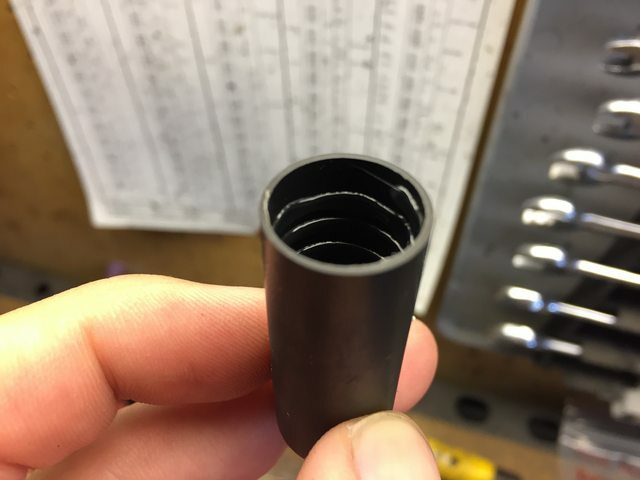 It has a spiral of heat shrink bonded inside that shrinks lengthwise and contracts the diameter quite significantly. This type of cap also has some glue inside that melts as you heat it up and sticks the cap on pretty well. Boring little job but I like fixing stuff like this and knowing that it's right now. While I had the heat gun out, I decided to finally try the old bumper blackening trick for myself. 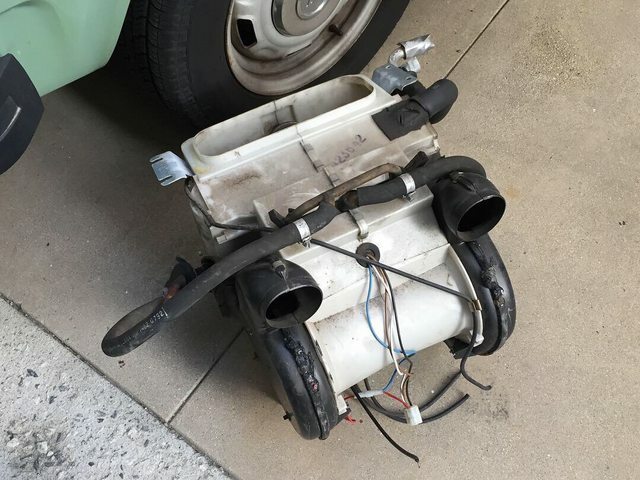 These skinny bumpers were from the junkyard and are nowhere near perfect. Lots of gouges. They were also getting quite gray. Much better now after a quick clean and waving the heat gun around for about 30 minutes. I can live with these now. What is the benefit to capping off/deleting the charcoal canister thing? None that I know of. I simply haven't hooked it back up yet since the engine swap. Probably will do so in the future. 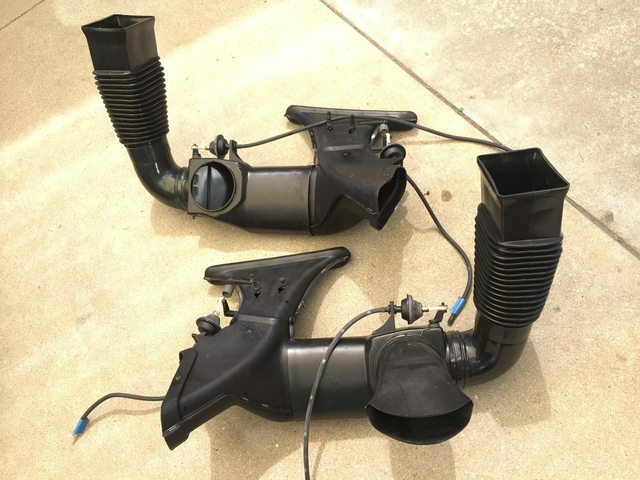 It's just for fuel vapor recovery. It's still there and connected to the tank. 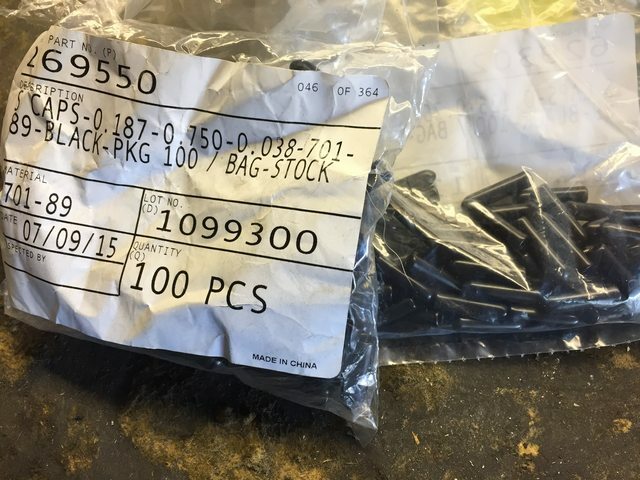 I used to snag the 1/8npt pipe plugs off n/a intake manifolds at the junkyard. I don't like rubber caps either. I'll do pipe plugs if these caps don't hold. 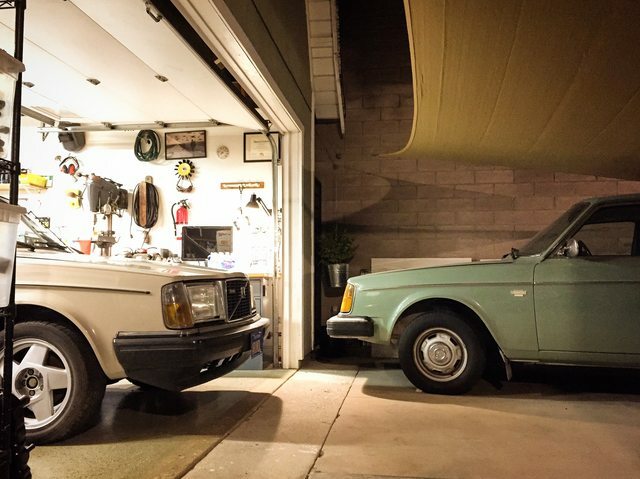 Your junkyard story reminds me of how I would grab the little 1/2" hose clamps off of W123 and W126 Mercedes diesels in the yards. Seemed like an endless supply of them and the hose clamps were the best. Supply of those cars has almost all dried up now though, just like 240s. Any chance you have more of those slick dizzy mount coil brackets? A template? I’d like to see one in stainless 😉. Came to this thread via the wasted spark thread and read page 19 after after I made this post. I see you have a plan to make em, maybe a complete install kit. Pretty please! Soon! - the temp gauge isn't matched to the sender in the head, so "normal hot" looks like "OMG overheating" on the old 1981 gauge. The e-fan comes on just as the needle gets up to the bottom of the red zone. I adjusted this on mine -- was as simple as adding a small resistor to the wire coming from the sender. Ya'll probably already know that, but just in case. Wish I could remember what resistance I ended up settling on....but that info is long gone. Any chance you have more of those slick dizzy mount coil brackets? A template? I’d like to see one in stainless ��. Good to hear feedback and know there is interest. I will get back on this project and post updates in the main wasted spark thread and on my website. It's a simple little thing, I just need to take measurements from my prototype and work out manufacturing. Any particular reason you're interested in stainless? The bracket ends up being quite hidden by the coil pack itself. I was planning on painted and/or zinc plated mild steel. Well it's good to hear that a simple mod is all it needs - thanks! I've been running the coil there for almost 2 years with no issues whatsoever. The stock LH2.4 distributor lives there on 240s, and the internal electronics don't seem to have heat related failures on those. It's a nice open spot once you ditch the distributor, and lets you use stock 240 wire routing (albeit with modified terminals). Cool that you have a similar 240. Those Hydras have been on there for 10 years and won't seem to go away no matter how hard I stare at them! 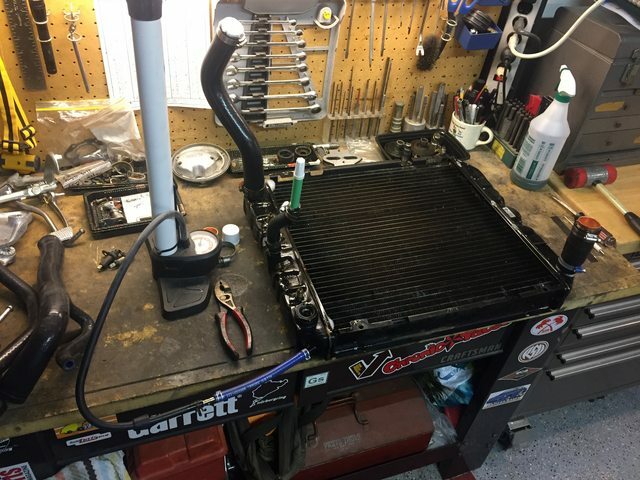 Last edited by Duder; 12-07-2018 at 06:28 PM..
First up was pulling the radiator to figure out what was up with a persistent leak. 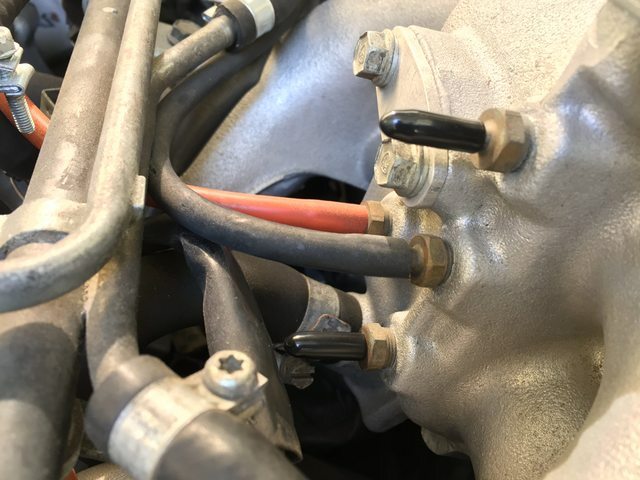 I thought I was having a sealing issue at the lower hose, and tried various different hoses, different types of clamps, multiple clamps, all to no avail. It would always send a few drops dribbling down onto the lower radiator mount area. Slow enough that I could drive it, but super annoying. The rad itself is a brass 3-row aftermarket piece, CSF brand I believe. I pulled it out and made up a quick pressure test rig using hose sections, caps, and a bike pump. This confirmed there was a leak, or rather 2 of them. Spraying soapy water around I found the passenger side end tank had two problem areas. 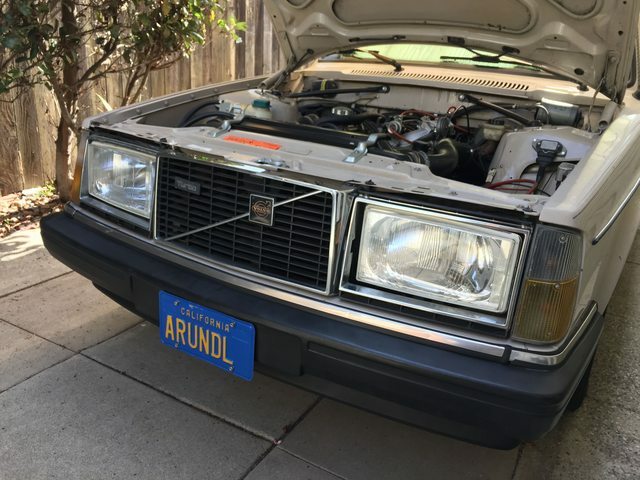 Remembering I had the original OE Volvo 2-row brass radiator still kicking around, I tested that one too, and found it has several punctured tubes. 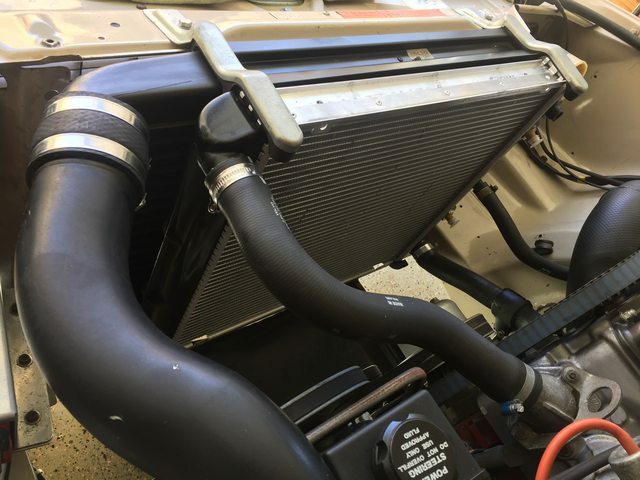 So I ordered a new cheap aluminum / plastic 240 replacement radiator from Rock Auto. Hopefully that ends the madness. I may try soldering up the 3-row rad to see if I can salvage it. 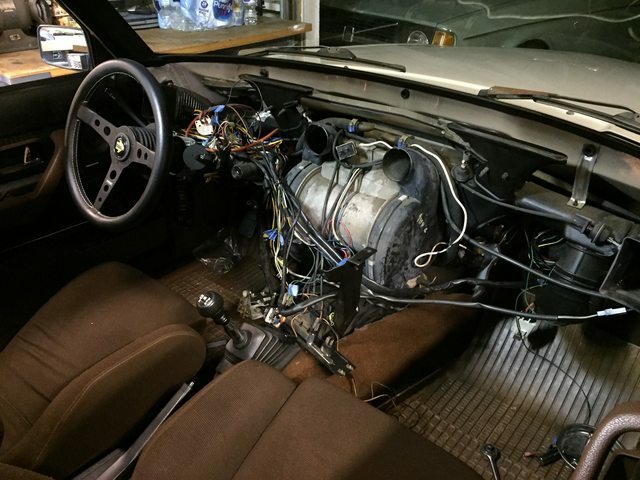 With the cooling system open, I figured this would be the best time to rip the dash out and replace the whole HVAC box with one from a '93. 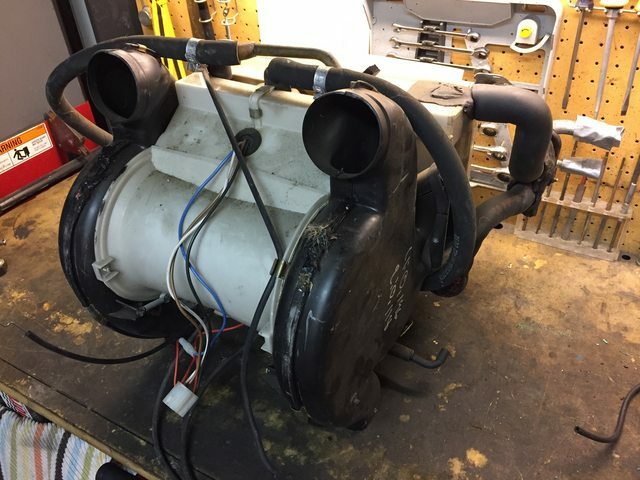 I've had this around for a few years, with the plan to upgrade to full '93 spec AC - evaporator, condenser, etc. The correct compressor is already on the engine so this was the next step. The other thing is that this car for the past 10 years (at least) has had a dead blower fan. The whole time I've owned it, no fan whatsoever. I was ready for that to change! About 2 hours after starting, I was down to this point. Old assembly comes out, leaving leaves. Ha. 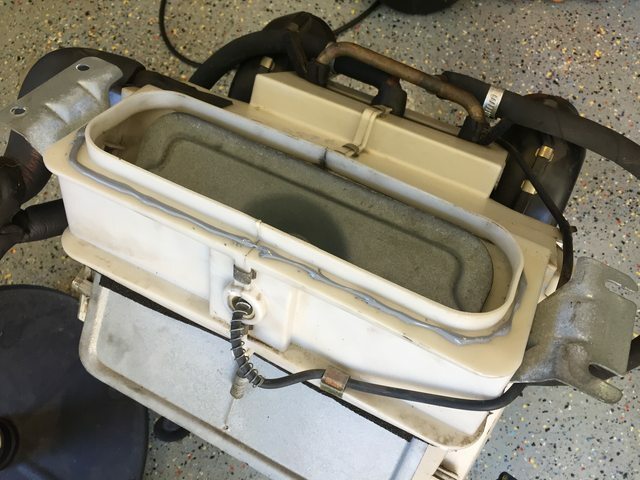 Cleaned the snork-hole out really well with a shop vac. "New" 1993 box out of storage. 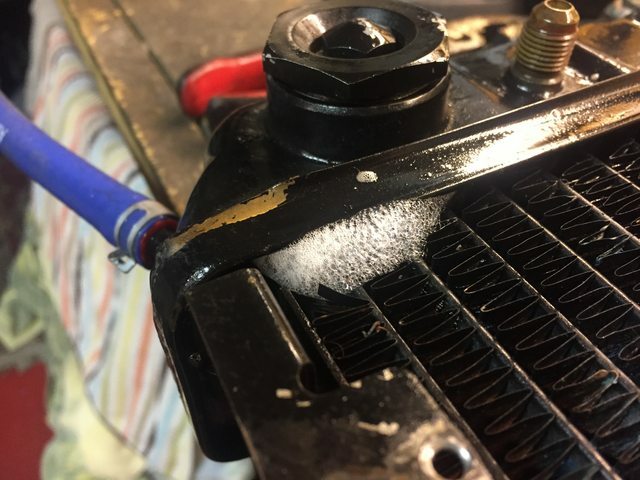 I pressure tested the heater core and it checked out fine. 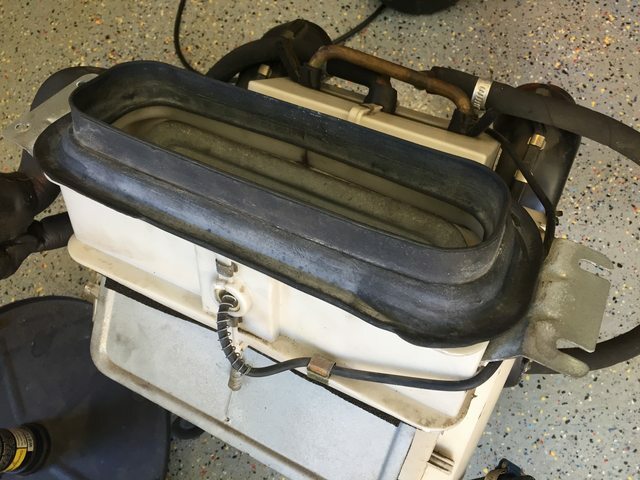 Cleaned up the evaporator fins, re-glued the big rubber inlet gasket. 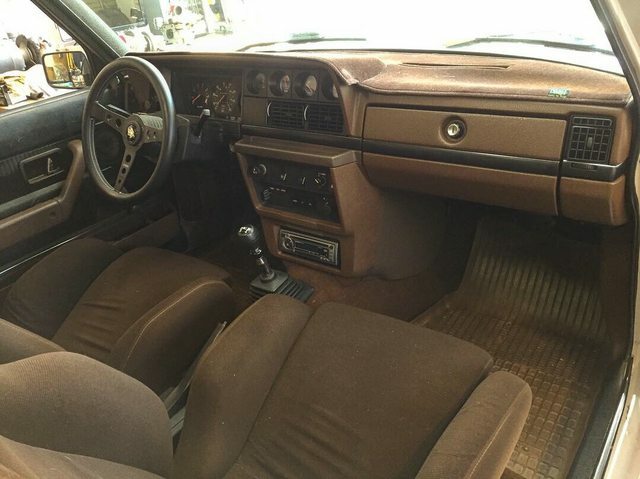 Original vents cleaned - 35 year old cigarette smoke residue is gone. It's in! 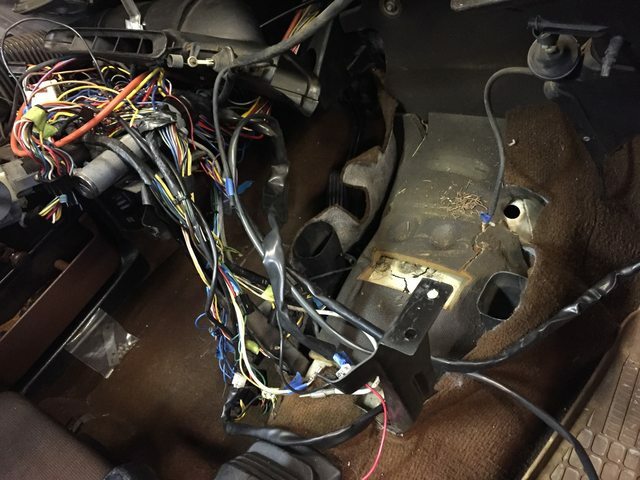 Spending some time cleaning up wire routing now before reinstalling the dash. Should have this all buttoned up in the next day or two, then it's on to more exciting jobs. 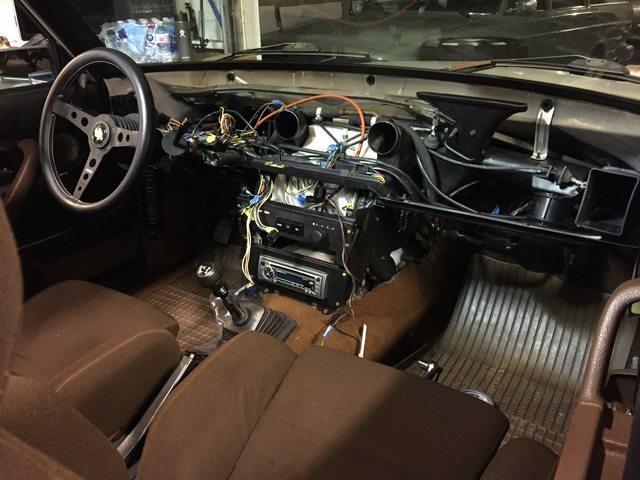 I’m in the middle of putting my dash back together too. Really satisfying to clean out all the ducts and vents. I found a bunch of artifacts, everything from acorns to a movie rental membership card from 91’. Beautiful car. Hey, Prototipo buddies! Are you going to do any additional moves for the air ducts to seal better? 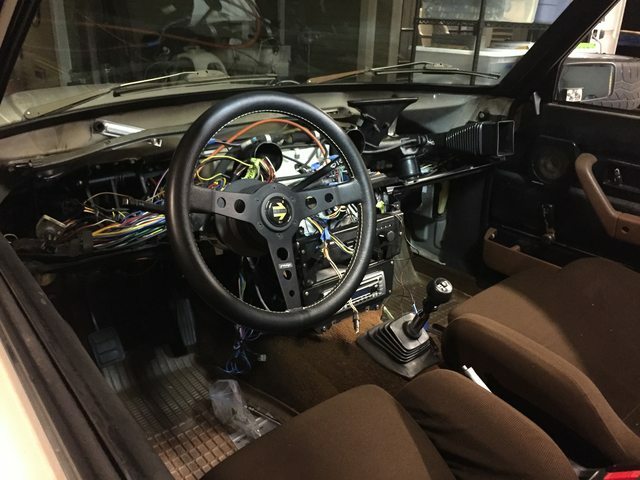 The Prototipo is an awesome steering wheel indeed. I'm not sure I could be convinced to use anything else on a future project, I like this one so much. More exciting stuff. 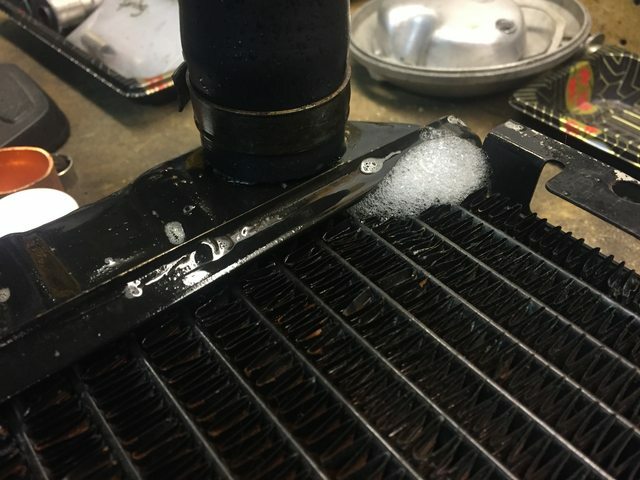 Got my intercooler cleaned out - there wasn't much oil but enough of a film to warrant spraying some simple green in and letting the schmoo drain out. Installed the new aluminum radiator. 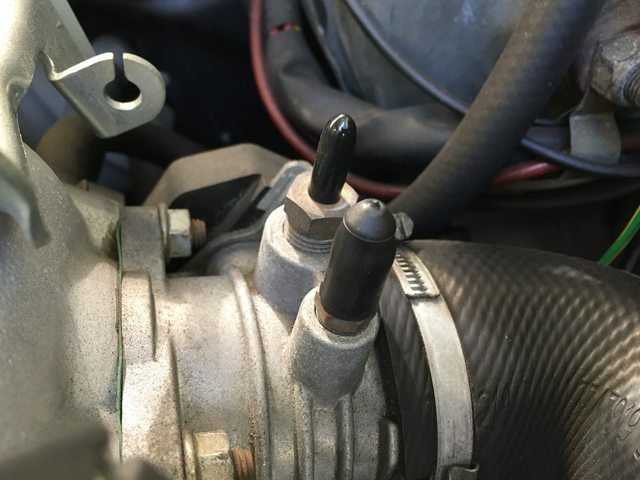 Found that my compressor outlet to intercooler hose is rotten and cracked; ordering a new one. Found my stash of ABA hose clamps and started using them liberally around the engine bay. 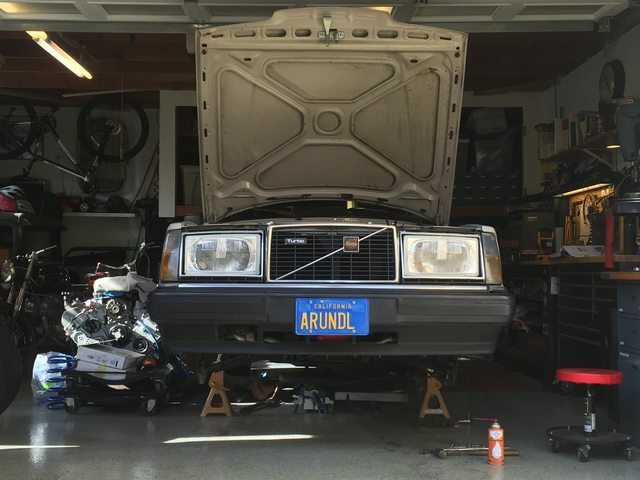 Took the rear suspension apart today; installed the ipd springs I've had kicking around for years, and Bilstein HD dampers. I've also had a set of the ipd adjustable torque rods and panhard rod kicking around, so installed those too. 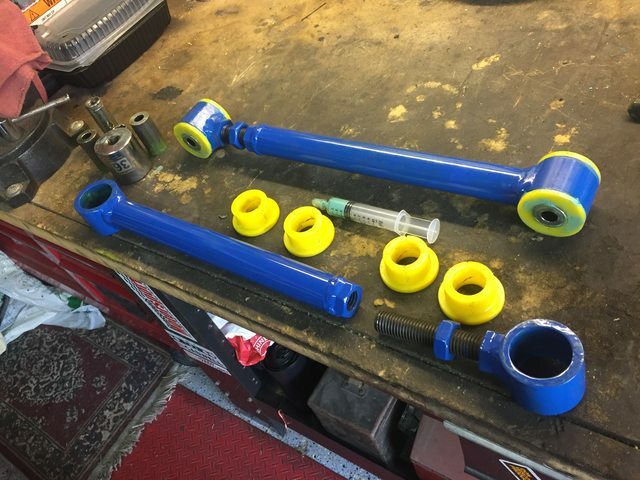 The torque rod poly bushings come from ipd without any lubrication at all, so you have to press the sleeves and bushings out and grease 'em up. 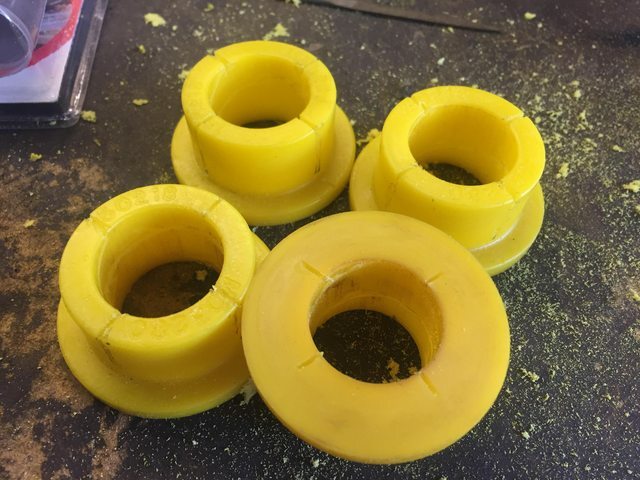 I cut some grease retention slot features into the ODs and faces of the bushings, and then made some spiral grooves in the IDs. Hopefully this will help the aqualube grease stay in there a bit longer. 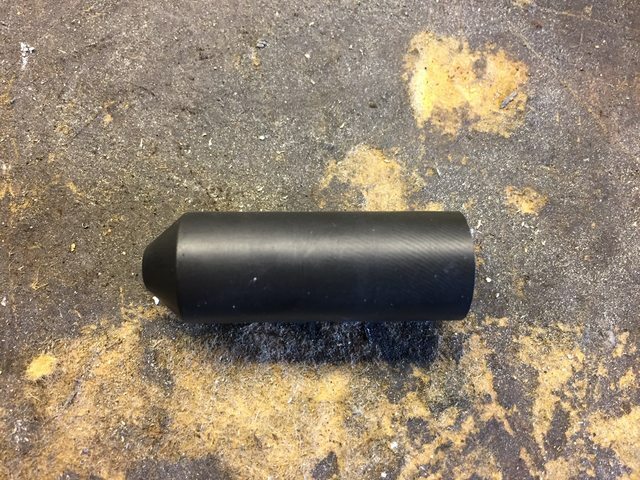 The panhard rod bushings were already greased. Just need to adjust the lengths now to get everything centered correctly. 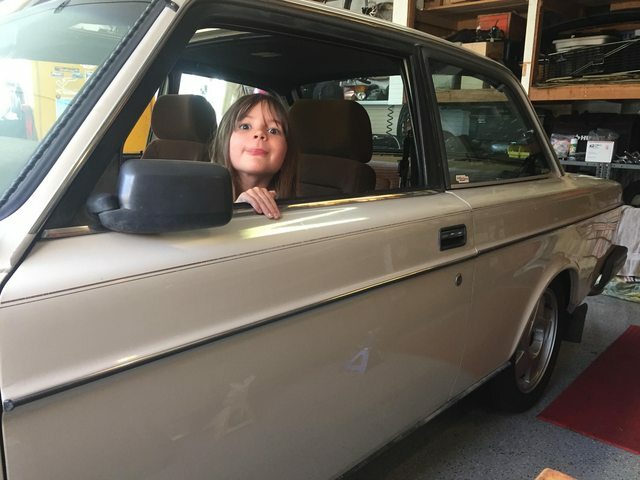 My kid came out to the garage to help for a few minutes and learn about springs. She likes crawling under the car to check stuff out. 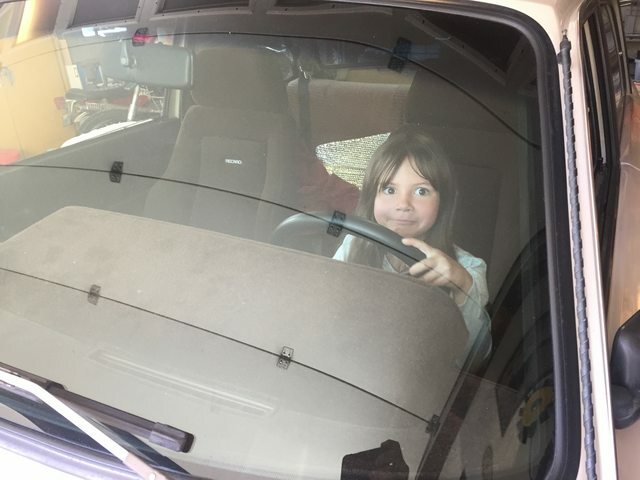 And of course what kid could resist getting behind the wheel and hamming it up? 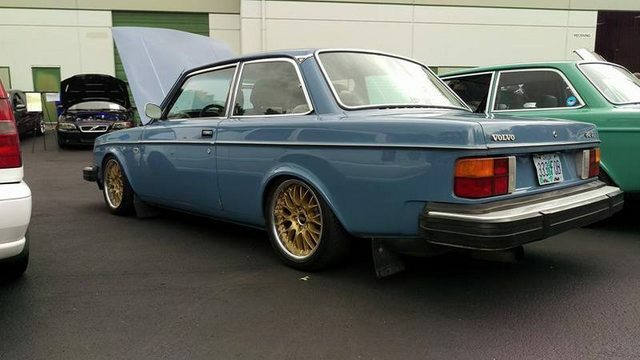 Lowered rear ride height visible in the last pic above. Now the front is apart; hopefully not for more than a few days. Awesome kid help pictures. That's what it's all about. The HDs I have came with the blue dust boots, but no bump stops. I have a set of new stock style bump stop / boot combo pieces. I could cut part of the bump stop out of that and use it on the HD. What have others done here? I'm sure there's some accepted solution for this, but didn't have much luck through searching. Got it - inverted dampers - thanks! Didn't really consider that but now I have seen the light. Similar to upside-down forks in the motorcycle world. They do that for increased stiffness mainly, I think. Possibly similar benefits with a strut / damper assembly.